Guide to Rio Arriba County, New Mexico ancestry, genealogy and family history, birth records, marriage records, death records, census records, family history, and military records. One of the Nine original counties formed in 1852. The county seat is Tierra Amarilla. The County is located in the north central area of the state. 1848 - New Mexico Territory formally became a part of the United States when the Mexican-American War ended in 1848 with the signing of the Treaty of Guadalupe Hidalgo. 29 December 1863 - Arizona Territory created from the western half of New Mexico Territory. Rio Arriba county was reduced in size to the portion still within New Mexico Territory. 24 February 1887 - RIO ARRIBA county lost land to creation of SAN JUAN county. 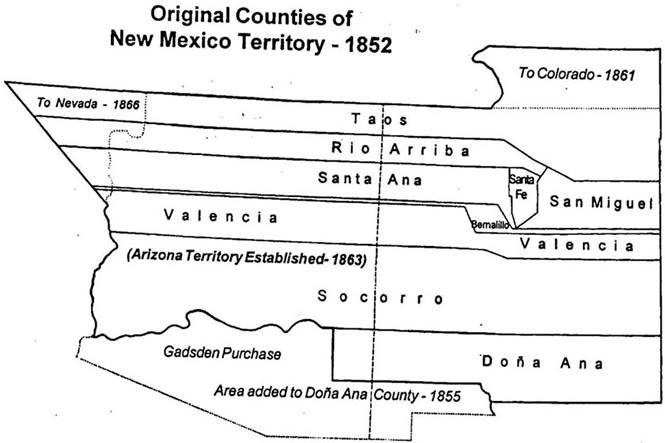 Rio Arriba and other counties in New Mexico Territory in 1852. If you wish to search the recorded land records of Rio Arriba county you must visit the County Clerk's Office at 7 Main Street, Tierra Amarilla, New Mexico or 1122 Industrial Park Road, Española, New Mexico. Local histories are available for Rio Arriba County, New Mexico Genealogy. County histories may include biographies, church, school and government history, and military information. For more information about local histories, see the wiki page section New Mexico Local Histories. ↑ Handybook for Genealogists: United States of America, 10th ed. (Draper, Utah: Everton Pub., 2002), Rio Arriba County, New Mexico. Page 474 At various libraries (WorldCat); FHL Book 973 D27e 2002; Alice Eichholz, ed. Ancestry’s Red Book: American State, County, and Town Sources, Third ed. (Provo, Utah: Ancestry, 2004), 470. ↑ Wikipedia contributors, "Rio Arriba County, New Mexico," in Wikipedia: the Free Encyclopedia,https://en.wikipedia.org/wiki/Rio_Arriba_County,_New_Mexico, accessed 8 February 2019. This page was last modified on 9 February 2019, at 04:50.